Siblings: (elder) Charlotte Ellen Tweed Newman b. 1895 d.s.p. Arthur Maurice Tweed Newman 1897 - 1915 killed in action d.s.p. Rev. Arthur Maurice Newman 1918 - 1982 d.s.p. On the reverse side of the miniature pictured above are the words: "Charles Edwin Tweed Newman, son of Rev. 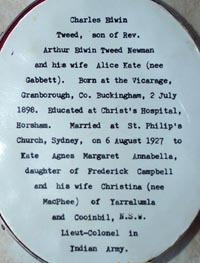 Arthur Edwin Tweed Newman and his wife Alice Kate (née Gabbett). Born at the Vicarage, Granborough, Co. Buckingham, 2nd July 1898, educated at Christ's Hospital, Horsham. Married at St Phillip's church Sydney on 6th August 1927 to Kate Agnes Margaret Annabella, daughter of Frederick Campbell and his wife Christina (née MacPhee) of Yarralumla and Cooinbil NSW. Lt-Col in Indian Army." 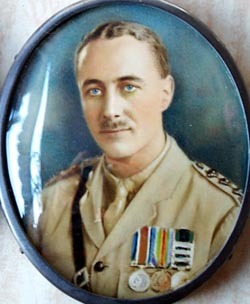 "Col. Charles Edwin Tweed Newman, of Rajputana Rifles, Indian Army, later of NSW Australia; b. 2 July 1898, the Rectory, Granborough, Buckinghamshire, educated Christ's Hospital London, War Service France 1917-18, commissioned British Army Lt 1918; Indian Army 1919 - 45; Major by 1929 (NW Frontier); CO (Acting Brig. Gen) 7th Battln. XIX Hyderabad Regiment. 1943-45 trained troops for active service in Burma against Japanese Imperial Army; retired Lt. Col. in 1945; hunter and sportsman, travelled to Australia to buy ponies for polo-cross, met and married Kate Campbell of Yarralumla Station, Canberra 1927; author of Campbell history 1961; died 20th Mar 1985 aged 87 years, survived by two sons and one daughter." When I met Campbell Newman at the Gold Coast in 2004, he described his grandfather as a great story-teller and a great iconoclast. He also expanded on Charles's war exploits, telling how he had been sent to the trenches after enlisting in 1917 where his cricketing skills were put to use in catching hand-grenades thrown from German trenches and returning them before they exploded. Edwin was one of the lucky ones to survive this normally short-lived occupation, but he suffered shell-shock as a result of the experience. He gained an early commission because so many officers had been killed in the trenches that replacements were urgently needed. Note: There is a comment at the end of my my father's Missing Years where he mentions that "One day in the 1920's two Newmans shared a railway compartment from Rawalpindi. And discovered that we were first cousins once removed, his grandfather being my great grandfather. His name was Charles and he was looking forward to his retirement from a Rajput (?) regiment when he and his Australian wife proposed to go horse-breeding Down-Under". Note - An error was transcribed onto my father's version of the family tree, where Arthur's son is called Charles Edwin Tweed Newman. 3rd Feb 2010: Clif Knight sent me a document describing the "Walter Campbell Memorial Trust" describing Walter as the younger brother of Kate Campbell, who (presumably) is the lady who married Charles Newman.